Time to go big and get nasty. This 4 1/2 inch .75 oz square bill crank designed by Tater gets it done! It moves through cover as slick as homemade butter. The bait features a handmade lexan square bill and stainless steel wire throughout. Baby was made to last and built to cast. It will reach depths of 8 to 10 feet depending on line weight. In testing we used 12 pd line and had no problem bumping cover at 8 feet. GET NASTY with those BIG GIRLS and bring that kicker fish to the weigh in. Currently only have 2 options as show in picture. More coming soon or PM Tater if you have a custom color. 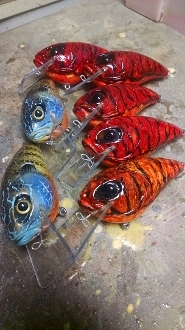 All baits are made after you order so allow 2 to 5 weeks for shipping.